Lisa R. Cohen in conversation with filmmakers James Bluemel and Hassan Akkad. Akkad was also one of the film's main subjects. 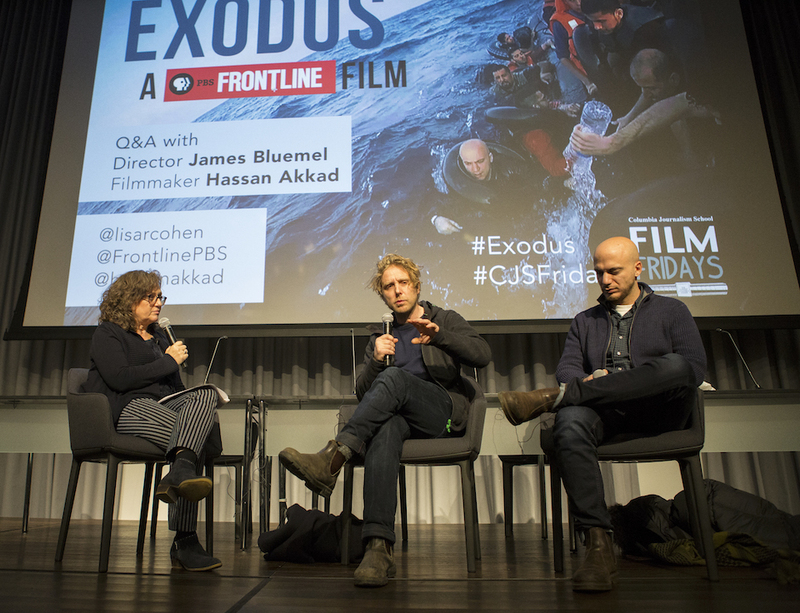 This week, we feature a candid conversation with Director James Bluemel and his fearless subject and fellow filmmaker Hassan Akkad about their award-winning documentary Exodus. The film features the extraordinary footage of refugees fleeing to Europe, including Akkad's own journey from Syria. The conversation, moderated by duPont-Columbia Awards Director Lisa R. Cohen, explored the questions of journalistic duty versus moral obligation reporters face when documenting a humanitarian crisis. Bluemel and Akkad discussed the thorny ethical and journalistic questions that arose duing the making of the film, including when they first met in France's infamous refugee camp of Calais. Bluemel, who was already working on the film, was searching for a subject who would be trying to cross the English channel. When Bluemel saw Akkad negotiating with smugglers to get on a boat to Britain, he started filming Akkad without his consent. The event was part of the Film Fridays documentary series, sponsored by The Alfred I. duPont-Columbia Awards and The Columbia Journalism School Documentary Program. Exodus, from FRONTLINE PBS, won a 2018 duPont-Columbia Award. PLUS: Tune in to learn how to win our new On Assignment tote bag! Newer PostNatalia Antelava talks Putin, Russia and attacks on the LGBT community in "Russia's New Scapegoats"